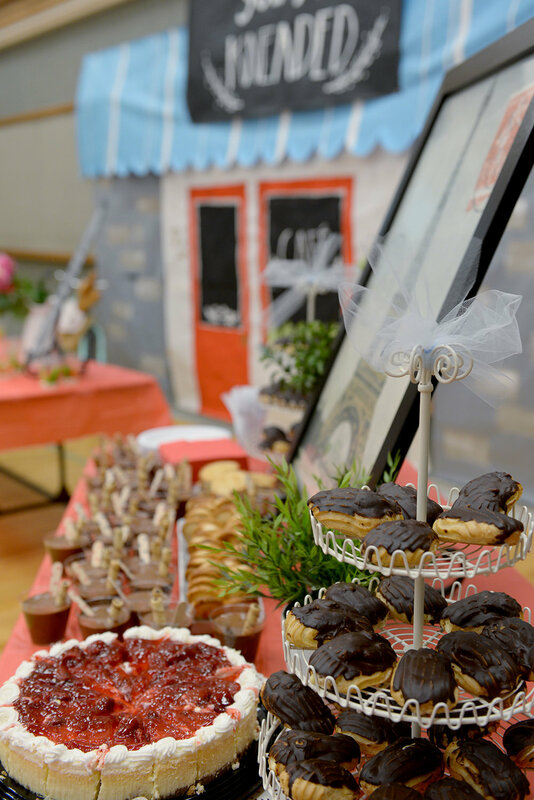 Every year, the ladies at Latter-Day Saint churches around the world have a "Relief Society Birthday" celebration, in honor of the wonderful group of women we belong to and our faith. This year, I was so excited to be heading up the committee. 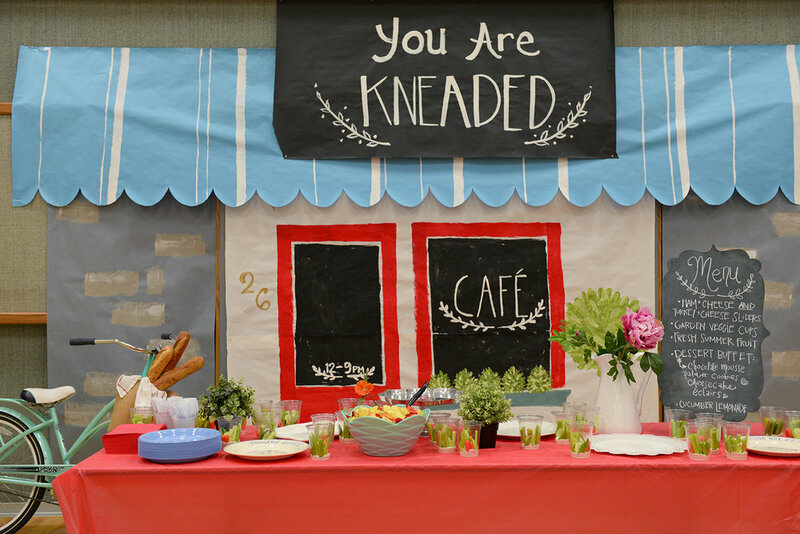 We decided the theme "You Are Kneaded," based on this inspiring Women's Conference talk. We managed to go all out and turn our cultural hall into a French café, even on our small budget! Again, butcher paper is this party-throwers best friend. With some acrylic paints, a big white piece became our "store front," a couple grey pieces became stone walls, and black butcher paper was painted with our theme as a shop sign. I pulled out the blue paper awning I made for Nina's Paris party and put it to good use again! A cute borrowed bicycle and a woven basket bag filled with baguettes brought the scene to life, along with some (fake) potted plants. 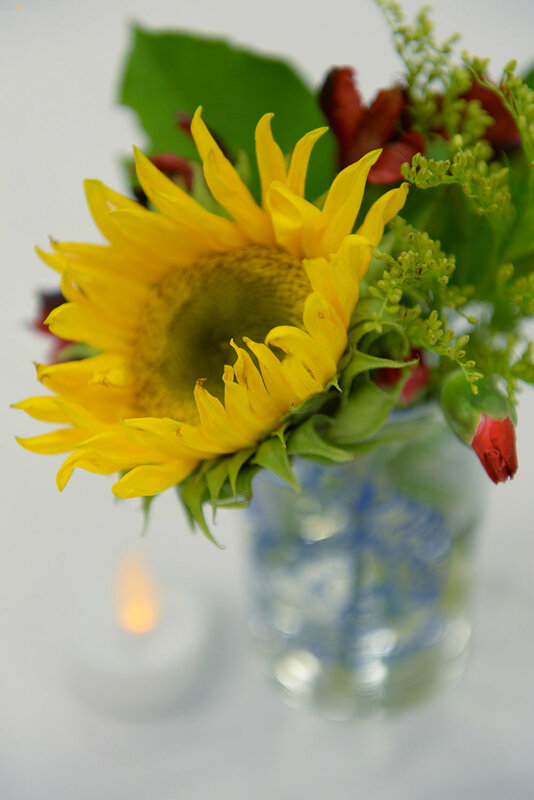 Small vases of fresh flowers went on each table (day old are unbelievably inexpensive and still so pretty). A small table at the door held the party favors; tiny French Bonne Maman jam jars for everyone to take home. I baked a couple loaves of artisan bread to give away to the winners of the drawing. Apart from chatting it up with all the ladies, the best part of any party is ... the FOOD. Right? These ham and/or turkey sliders can be made ahead of time for a large group and are so good. Veggie cups with dip at the bottom are super easy, and my friend Leesa put together the most beautiful bowl of fruit. Cucumber Lemonade is a family favorite from my aunt Heidi and perfect for any summer gathering. I forgot to get a photo, but the recipe is below. Okay, now for the desserts. If I need an excuse to have an entire table full of French desserts, trust me, I can always find one. Éclairs, palmiers (thanks Costco), chocolate mousse (cheater style recipe), and a cheesecake for good measure (even though it's not necessarily French). French dessert table ... save me an eclair! Mix together soda, limeade concentrate, and almond extract. Cut cucumber in half. Puree one half in a blender and add to the soda/limeade mixture. Slice the other half to float in the limeade along with sliced limes. Add ice and enjoy!